You may use our website as a source of handouts, lesson plans and activities.You may download and use our materials with your students free of charge. What we ask in return is that you mention our website every time you use or share them. We would love to hear from you! Contact us to tell us about yourself, give us feedback on the materials that you tried with your students, and tell us what you are interested in so that we can develop many more lessons even better tailored to your needs. 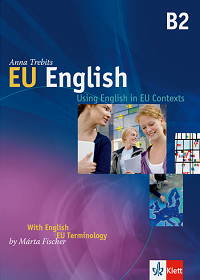 Check out sample pages of the course book EU English – Using English in EU Contexts here. You may download and use the task sheets, lesson plans, and other teaching materials from this site free of charge. All we ask in return is that you mention our site every time you use our materials.